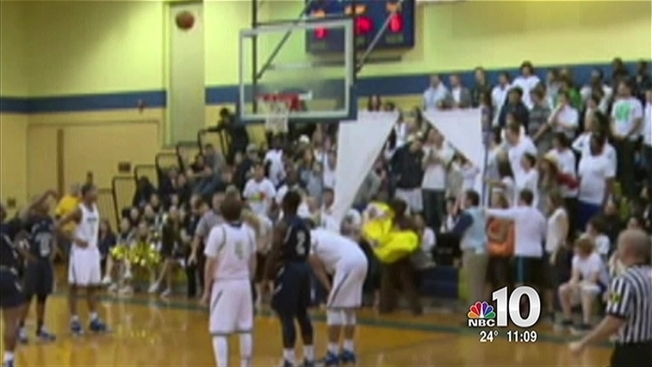 Costumes worn by students performing a skit during an Atlantic County, New Jersey, high school basketball game have some crying foul, saying it was racist. Dressed as a banana and monkey, two students from Holy Spirit High School tried to distract players from Atlantic City High School as they faced off at a tournament last week. Atlantic City's team is predominantly black. The skit, which also included a student dressed as a cowgirl and another as a bumblebee, was performed in the Holy Spirit student section and was recorded on video. "I absolutely think it was offensive," said Ricardo Belgrave as he left Friday night's match up against the two teams. "You should know when you're putting that costume on, it should come in your mind that this might offend African-American people." "To me it was harmless kids' pranks, you know. I didn't see any racial overtones to anything," said Jack Versput. Jermaine Baskerville said the kids were "just being silly," but believes their parents and administrators should have stepped in. The Cape Atlantic League's board of referees tells NBC10 the behavior was not appropriate and the game's referees were reprimanded. Students from Holy Spirit High School will not be punished, but have been warned similar actions would not be tolerated. There were no reports of issues at Friday night's game.